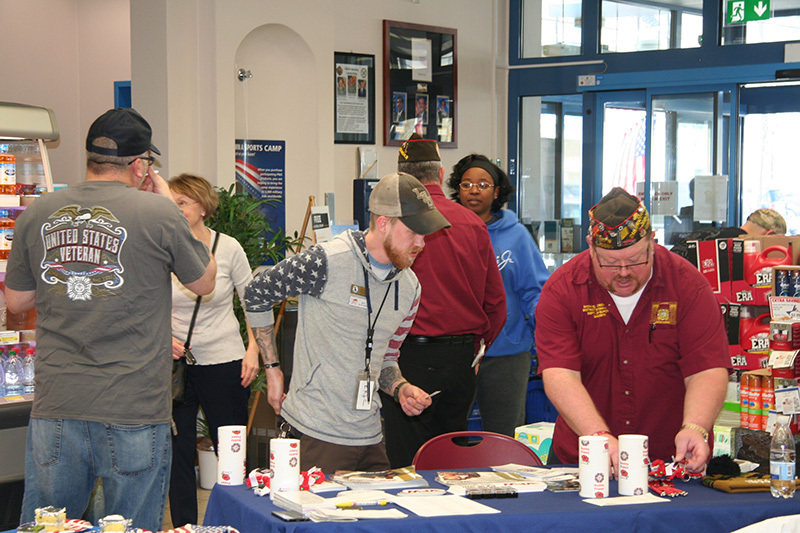 In observance of National Vietnam War Veterans Day March 29, the Hohenfels Commissary reflected on the service and sacrifice of Veterans and their families. Photo by Christina Wilson. HOHENFELS, Germany — In observance of National Vietnam War Veterans Day, the Defense Commissary Agency Hohenfels reflected on the service and sacrifice of these veterans and their families during a ceremony held here March 29. After the official opening ceremony, veterans and their families came together for some burgers, hot dogs and cake to exchange their stories and enjoy the beautiful sunny weather. Long before the Commissary opened the doors here in Hohenfels in October 1993, the first American military commissary, operated by the U.S. Navy in Vietnam, opened in Saigon in 1959. Americans living in base housing in the late 1950s and early 60s in Vietnam were able to have American food in a foreign country. Soldiers, spouses and family members appreciated that the commissary not only carried brand names items, but also fresh deli and baked goods. Some military retirees remembered that the commissary in Saigon was one of the largest and modern commissaries at that time. The Saigon Commissary was not able to accommodate the thousands of incoming combat troops in 1964, so branch commissaries subsequently opened their doors to support the soldiers, service personal, government civilians as well as contract workers and their mission. After the U.S. Army took over the commissaries in 1966, stores remained operational long after the 1973 “cease-fire” to support the non-combat mission personnel. In April of 1975, the local populations of Vietnam looted the abandoned American commissaries and the “end” of the commissaries in their country was sudden and unceremonious.